A great day all round with plenty of additions to the year list taking the 2014 total to 170. Although coastal migrants were thin on the ground a good spring count of Ring Ouzel was noteworthy. Seen between Ravenscar and Cayton Bay were, 4 Ring Ouzel (1 Ravenscar, 1 South Cliff, 2 Cayton Bay), 5 Blackcap, 1 Lesser Whitethroat (South Cliff) and 16 Chiffchaff. Elsewhere 6 Great Crested Grebe, the 9 Egyptian Geese and 4 Little Ringed Plover were at Wykeham South Lake, on Potter Brompton Carr (no general access) there were 2 Shoveler, 2 Gadwall, a Ruff (first of the year), 35 Sand Martin and 5 Swallow, a Grey Plover (first of the year) was on Black Rocks, a Water Rail was seen crossing the road in Staintondale, a Green Woodpecker was on Penny Howe Moor and 300 Linnet were at Long Nab. It was a fairly good day for passage too, on the move (south unless stated) were 2 Red-throated Diver north, 1 Fulmar + 9 north, 65 Gannet + 227 north, 5 Cormorant + 5 north, 3 Shag north, 2 Greylag Geese + 6 north, 1 Canada Goose, 1 Gadwall north, 2 Teal + 4 north, 3 Common Scoter + 3 north, 1 cream crown Marsh Harrier, 1 Red Kite (over Foulsike), 1 Merlin north, 1 Whimbrel north (first of the year), 1 Black-headed Gull, 1 Common Gull, 4 Great Black-backed Gull, 62 Kittiwake north, 3 Sandwich Tern + 1 north, 2 Common Tern (first of the year), 330 Auk sp + 429 north, 2 Puffin north, 1 Stock Dove, 8 Wood Pigeon north, 14 Sand Martin + 2 north, 12 Swallow + 1 north, 8 Meadow Pipit, 9 Flava, 1 Alba, 1 Jackdaw north, 1 Rook north, 2 Carrion Crow + 59 north, 1 Chaffinch, 27 Goldfinch + 1 north, and 343 Linnet + 19 north. 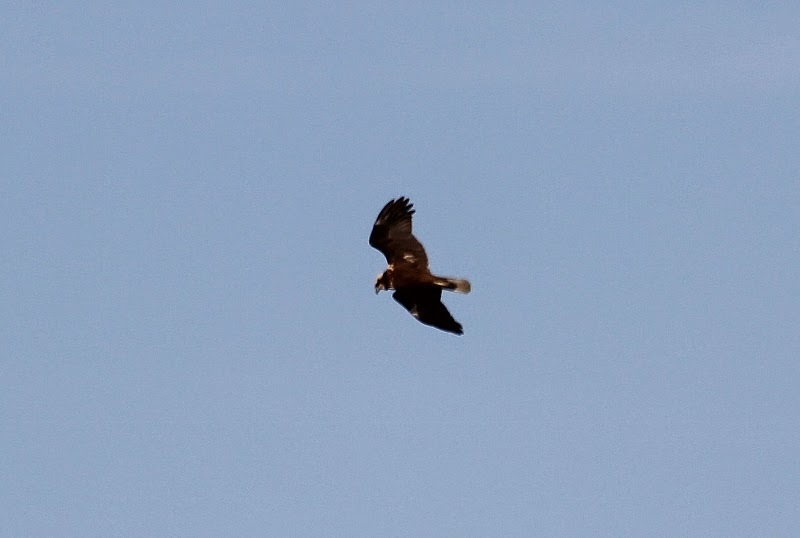 Marsh Harrier passing Long Nab - Michael McNaghten.